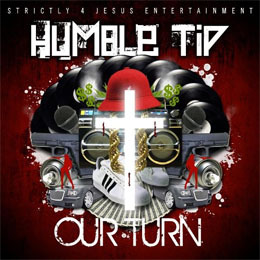 This is how the debut album “Our Turn” by newcomer Humble Tip begins. Before we jump into the review props must be given to Humble. He gets props on the promotion for this new album. There were at least a hundred people on myspace repping with the Humble Tip avatar; he had 2 or 3 music videos floating on the internet and a hot interview on the Wade O show with Brinson. Either H.T. is signed to Sony undercover or the Lord Jesus Christ is on his side. Now let's begin the music review for "Our Turn" with the first track "Bring it Back to the Church", a well produced, synth piano-laced track. It is a great intro song for this solid release. This kat name Humble Tip comes across full of Christ swagger. One thing I noticed about this emcee is his very distinct voice and flow. So distinct you can pick him out of any crowd of artists and know who he is. The best comparison of Humble Tip's style is a blend of K-drama mixed with Da T.R.U.T.H. ( his 1st cd ) with a dash of Lupe. But what sets him apart from the guys named above are his punchlines. fully explained myself. I really mean Humble Tip got punchlines. More punchlines than I have heard on any album over the past 5 years. The lines are full of wit and creativity. As a listener, I knew immediately that this guy is pretty smart. Here are a few lines just so you know this guy is serious. "Dudes are running from the Rock like Indiana Jones"
"They say I gotta a SNICKERS flow, these bars are Nuts"
rock the B just cuz he rock the T/ like Rocky 3/"
and His love gets me high like I’m the pole vault king/"
Change like the slogan for Obama/"
With that being said, I'm throwing his name in the hat for the punchliniest (if that is a word ) emcee in the Christian Rap realm. Here are some of the tracks where you will hear a lot of hot lines I got what you need, Dat Bangin Cypha and Look at Him. "Our Turn" should be described as a cd that is very evangelistic. Red Light Special explains how the sounds from your vehicle can be used by God. So when the person next to you wants to know what is that you’re bangin. You can tell'em it's Dat Jesus Muzik (or hand them Humble Tip's CD). But it's not from Lecrae (big ups to him) it's from Humble Tip. He raps "I turn this car into a ministry like a transformer" and the hook says "I'm at the Red Light with my Jesus Music Blasting". Humble wants his music to bang so much that he can give you what you need: the Word of God. One of the other emcees on this song has a hint of Lil Wayne in his style. This will attract some listeners and distract some others. Speaking of styles, Humble switches up his rhyme style several times on the album. On We Need Your Help, Humble Tip smoothes out his flow to deliver the message of how much we need Jesus. Also, on Impact with Breev Eazie they both have the fast tongue twist flow that would make Twista blush. Hearing this, you’ll know that Humble is not a one dimensional rapper. "Our turn" as a whole is beyond a solid project with some small cracks and minor scrapes. One of the best things about the album (the metaphors) turned out to be too much of a good thing by the end. Additionally, with Humble Tip being such a high caliber of rapper the other emcees on "Dat Bangin Cypha" were pretty much non-existent after Humble raps. But that is not so much of a bad thing in Humble's case. There are a couple of tracks I'd only listen to once. They weren’t my favorites mainly because of the beats. If you want to break out of the norm of your usual Christian rap cd cycle, have I got a artist to put you up on. Humble Tip's "Our Turn" is an album full of compelling tracks from a smart man (who now happens to be among my top emcees). One just has to wonder what is next for this guy with the crazy bars. Word to the wise, if you other MCs need a hot 16 for your album, give Humble Tip a call because this debut album shows he has the total package. Rapzilla.com’s 11 Freshmen of 2011 – KamB.I.N.O.